Ceramic Industry for the cleaning, smoothing and polishing.. The Ceramic Polishing Machine “E” range (DRY) & “W” (WET) range are designed primarily for use in the ceramic industry for the cleaning, smoothing and polishing of all types of ceramic ware before decorating or glazing. The Ceramic Polishing Mill provides fast, high volume smoothing and polishing of all types and sizes of tableware, ornamental ware and industrial ceramics in earthen, bone china, vitreous and porcelain bodies in the biscuit state. A smooth matt finish is produced which provides optimum glaze application and clear decoration definition. The machine is designed for continuous operation by manual operatives. 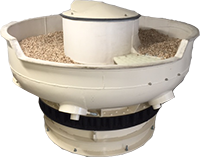 The high-efficiency three-dimensional vibratory tumbling work-mass action provides fast damage-free processing. 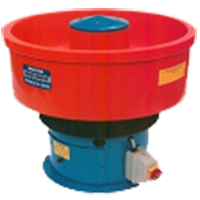 Speed and amplitude of vibration of the work-mass can be varied either by adjustment of the vibro-motor’s out of balance weights, or optional electronic frequency inverter. 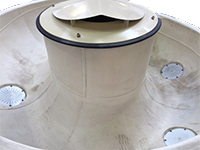 The Ceramic Polishing Mill Bowl is lined with white vulcanised abrasion resistant rubber which eliminates damage and chipping of the ware. The machines are designed for use with all types of natural or pre-formed ceramic, wood or “plastic” media or “chips”. Suitable for wet or dry operation with dust extractor and collector as illustrated. 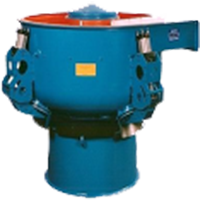 The principle of operation is that ware is placed into the lowest section of the bowl from where it is carried around by the three-dimensional vibratory tumbling action of the polishing media and completes one circuit of the bowl. The ware is collected manually from the polypropylene separation grid at the top of the spiral ramp or it can be ejected from the machine in the case of small items such as ceramic insulators. Dry processing is best achieved by connecting the machine’s extraction spigots via flexible ducting to a dust collector to remove loose dust from within the bowl. Easier to clean and reduced down time due to the addition of compressed air fittings to each dust port. Wood & Ceramic media ratio is 2:1 by weight but this can be varied to suit the hardness of the ware. Proven fact that the media should not be washed as the wood swells when wet and on drying splinters and fractures, this can cause issues during firing once glazed. Please contact us for any further information required.